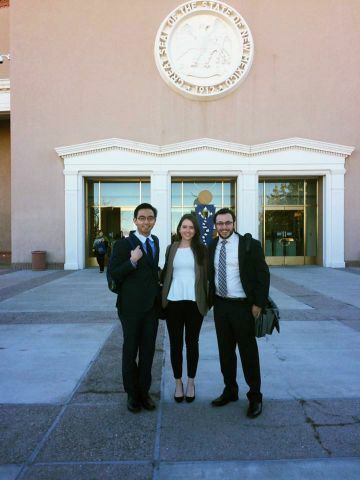 UNM Political Science students are pairing with state legislators in an immersive, week-long internship program. The students work as fully-credentialed aides at the Roundhouse in Santa Fe. While working in the state's capitol, they analyze policy, attend hearings and help draft correspondence to constituents. 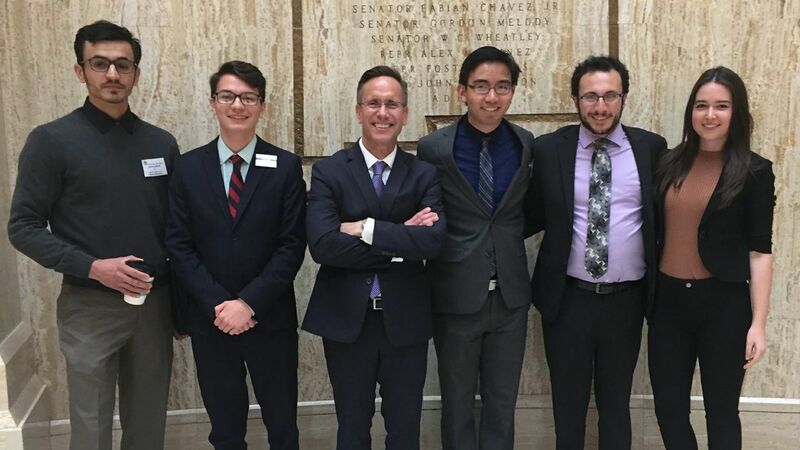 The University of New Mexico Political Science Department is partnering with state legislators to provide students with an immersive, hands-on learning experience in the state’s capitol. “It’s a real behind-the-scenes look that sheds light on the complexity, passion and human drama of self-government at the state level,” said Professor Timothy Krebs, chair of the UNM Political Science Department. Molly Callaghan and Gabe Gallegos are two of the students involved in the 2017 New Mexico State Legislative Internship. One is a sophomore and the other is a senior, but for one weeks during this legislative session, they exchanged their campus life for that of a legislative aide. The students were paired with representatives and senators in the Roundhouse, where they helped with the daily tasks of being an elected official. Their days included attending committee meetings, helping legislators on the House and Senate floor, drafting correspondence and analyzing bills. Molly Callaghan (m) and Gabe Gallegos (r) are two of the students involved in the 2017 New Mexico State Legislative Internship. 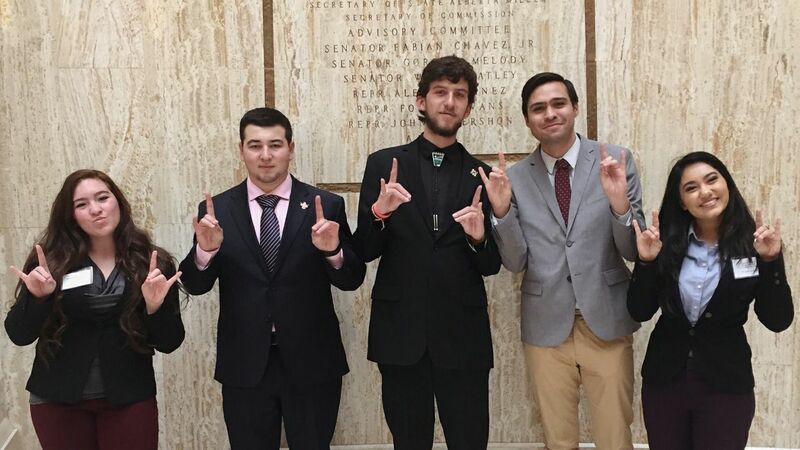 Every spring, the program accepts two groups of roughly 10-12 students, each group spending a week living in Santa Fe and experiencing the life of a full time political aide. During the internship, the students also attend lectures and workshops. Krebs says the hands-on approach does more than just emphasize the concepts learned in a political science classroom – it gives students the opportunity to experience legislation in action, from the conceptual idea, to the first drafts, to committee hearings and the floor vote. Along the way, the students are exposed to opposing views on legislation and the necessity for compromise, paving the way for these future leaders to be able to work with people from all backgrounds. The students say understanding people’s differences and how those variances can be advantageous, is even more important during these divided political times. 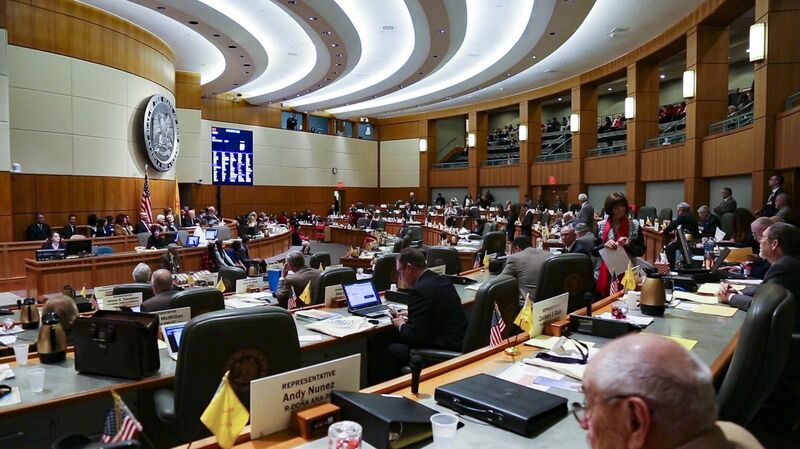 They were struck by how New Mexico legislators embraced each other’s differences and brought back an old-fashioned typed of politics, emphasizing face-to-face compromise. While experiencing the inner workings of the state political system, the internship simultaneously provides students opportunities to network with potential employers. 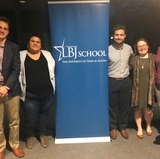 They attend legislative dinners and fundraisers, enabling them to create professional connections that will be beneficial well beyond graduation. The students say their experience wouldn’t have been possible without the help of their professors and teachers on the UNM campus. Faculty and staff were very supportive of students taking part in the internship-- even going so far as to reschedule exams or accept different homework deadlines so that the interns could be in Santa Fe for a week. 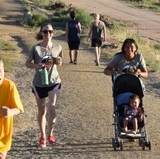 In addition, the program is financially supported by the UNM Office of Government and Community Relations, which provides the students with a stipend to defray costs connected to their internships. 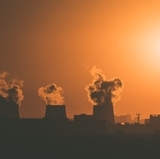 The success of the internship is also tremendous, as evident by the accomplishments of former participants. 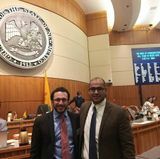 At least one alum is now a legislator, another is a top staffer with the New Mexico Higher Education Department and a third is working in government relations at Sandia Labs. Others have gone on to work in municipal government or with national political committees, leaving no doubt the program has a lasting impact on the careers of students who take part. To apply or learn more about the internship, visit the UNM Political Science Department’s website.